If you are gluten-intolerant, you may worry about your baby’s health as you wean him or her, but the guidelines for healthy development are easy to understand and simple to follow. Formula milk is gluten free and you need not worry about moving from breast to baby milk in this respect. There is a 1 in 10 chance the child of a woman with gluten intolerance will become gluten intolerant. This is only slightly higher than the proportion in the population as a whole. There should be no difference in the way a baby is weaned, whether or not there is gluten-intolerance in the family. Weaning means introducing solid food. While there is no set age at which to wean a child, most authorities agree that attempting to wean a child of younger than four months is counterproductive and can cause stomach upsets. Between four and six months most children will become ready to eat some semi-solid food and keeping your child on milk alone until six months of age will not harm his or her development. Hungry babies are more naturally inclined to accept solid foods, so if your baby is happy with breast or formula milk, do not worry. Natural development will lead to them moving onto semi-solid foods when their milk diet is not sufficient to sustain them. On the other hand, don’t wait until your baby is starving as they won’t understand that a spoon and bowl are delivering food in a novel fashion and may reject the whole idea in favour of getting what they are familiar with! If you are worried about introducing gluten, a discussion with a health visitor or GP is the most sensible first step. There is some research to suggest that introducing gluten while you are still breastfeeding may be beneficial to your child, but the evidence is not yet conclusive. Some parents fear introducing gluten if they are gluten-intolerant themselves, but it is important not to delay the exposure to gluten for too long, as that can cause a child to reject an unfamiliar taste and lead to a misinterpretation of the rejection as intolerance. 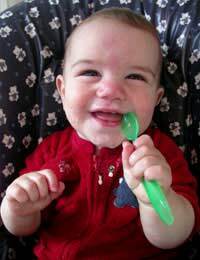 Remember to offer tiny amounts of new foods, and to give your baby time to learn to eat the food and to digest it. Your baby is exposed to a lot of novelty when being weaned and taking it slowly can help allow time to adjust. Where there is a family history of gluten intolerance it can be wise to continue to breast feed for up to a year. Remember to ensure your baby has a varied diet. If you cannot eat certain foods yourself, it can require a special effort to make sure you offer them to your baby. Most packaged baby foods are specially formulated to offer a wide range of new tastes and textures along with the right level of nutritional inputs for a weaning baby. It’s vital to appreciate that gluten intolerance can only be diagnosed when gluten is included in a child’s diet. Postponing or excluding the introduction of gluten does not help define the role of gluten in a baby’s dietary health.